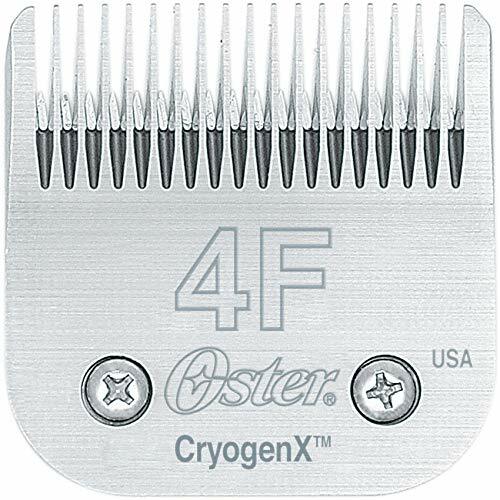 Oster Size 4F CryogenX Traditional Blade Innovative heat reducing technology and legendary sharp cutting performance to provide the user with the coolest and sharpest blades possible. Elite CryogenX blades are even further optimized with a titanium coating increasing its overall surface hardness, making them the longest wear-resistant blade Oster products offers. The tough cutting edge is hard, but not brittle, with a coating that won't flake or wear off. Size 4F: Full Tooth for long hair cuts 3/8" cut/9.5mm. NOTE: Oster CryogenX™ Blades fit all A5 and Power Pro clippers. If you have any questions about this product by Jarden Consumer Solutions, contact us by completing and submitting the form below. If you are looking for a specif part number, please include it with your message.